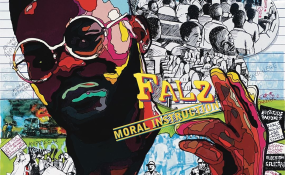 Recently, Funmi Falana, lawyer and mother of Falz said at Falz's 'Moral Instruction' album listening session disclosed that she was worried her son does not go to church. "Folarin, you don't go to church and I am bothered," she said. "I hope you would start going to church this year." "I have nothing against the church or going to church; everyone has the right to practise the religion they desire but personally, as a Christian, it has been a while that I have been to church. The most important thing is spirituality and your personal connection with God," he said.